For the football player, see Bennie Thompson (gridiron football). Bennie Gordon Thompson (born January 28, 1948) is an American politician serving as the U.S. Representative for Mississippi's 2nd congressional district since 1993. A member of the Democratic Party, he has been the Chairman of the Committee on Homeland Security since 2019, previously holding the position from 2007 to 2011. The district includes most of Jackson and is the only majority-black district in the state. It is approximately 275 miles (443 km) long, 180 miles (290 km) wide and borders the Mississippi River. The Mississippi Delta comprises the vast majority of the 2nd congressional district. 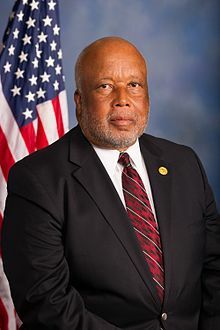 Thompson was both the first Democrat and the first African American to chair the House Homeland Security Committee (2007–2011). He is the dean of Mississippi's congressional delegation. Thompson is a lifelong resident of Bolton, near Jackson. He attended Hinds County public schools before earning a B.A. in political science from Tougaloo College in 1968 and an M.S. in educational administration from Jackson State University in 1973. He served as an alderman, then mayor of Bolton before being elected to the Hinds County Board of Supervisors. As Chairman of the full committee, Rep. Thompson may serve as an ex officio member of all subcommittees. National Guard & Reserve Components Congressional Members Organization. Thompson ran in the seven-way special election held on April 13, 1993 after Mike Espy gave up the seat to become Secretary of Agriculture. With five other Democrats splitting the vote, he finished second behind Republican Hayes Dent with 28 percent of the vote. He then defeated Dent in the April 13 runoff with 55 percent of the vote. He won the seat again in 1994 and has been reelected 12 times. He has faced serious opposition only twice, when journalist Clinton LeSueur held him to 55 percent in 2002 and 58 percent in 2004. Thompson became an outspoken advocate for the Gulf Coast after Hurricanes Katrina and Rita hit in 2005. From his position on the Homeland Security Committee, he pushed for accountability at the Federal Emergency Management Agency (FEMA) and a careful review of the role of the Red Cross in the time of disaster. He also pursued waste, fraud, and abuse in hurricane contracting and called for preferences to be given to small and Gulf Coast businesses in the recovery and rebuilding of the affected states. Thompson is the founding member of the bipartisan Gulf Coast Recovery & Rebuilding Caucus in the House of Representatives. Thompson's voting record has been decidedly liberal; he is by far the most liberal member of the Mississippi delegation and arguably one of the most liberal congressmen ever to represent the state. He is a founding member of the Congressional Progressive Caucus. His legislative platform focuses mainly on homeland security, civil rights, agriculture and rural issues, equal education and health care reform. In 1975, he became one of the original plaintiffs in the Ayers Case, which concerned the adequate funding of predominantly black educational institutes in Mississippi. In 2000, Thompson wrote legislation that created the National Center for Minority Health and Health Care Disparities. During his tenure as chairman of the Homeland Security Committee, Thompson focused on assuring that state and local officials, as well as first responders (fire, police, EMTs), got the resources they needed to protect their communities. Thompson was particularly concerned about local officials getting adequate resources, having been a volunteer firefighter and a local elected official for 24 years. He was one of the 31 who voted in the House to refuse to count the electoral votes from Ohio in the 2004 presidential election. Along with John Conyers, in April 2006, Thompson brought an action against George W. Bush and others alleging violations of the Constitution in the passing of the Deficit Reduction Act of 2005. The case (Conyers v. Bush) was ultimately dismissed. On January 5, 2007, Thompson introduced H.R.1, "Implementing the 9/11 Commission Recommendations Act of 2007," the first bill of the 110th Congress. The bill, cosponsored by more than 100 House Members, provided for the implementation of the 9/11 Commission's remaining recommendations. It included provisions requiring major improvements in aviation security, border security, and infrastructure security; providing first responders the equipment and training they need; beefing up efforts to prevent terrorists from acquiring weapons of mass destruction; and significantly expanding diplomatic, economic, educational, and other strategies designed to counter terrorism. The bill had bipartisan support and passed 299–128 on January 9, 2007. On July 27, 2007, the Conference Report on H.R. 1 passed the House overwhelmingly, 371–40. The previous day, it had passed the Senate 85–8. The President signed H.R. 1 into law on August 3, 2007. With the passage of H.R. 1, Thompson is the first African-American Chairman of a House Committee to have a House–Senate Conference on the first bill introduced in either the House or the Senate in any given Congress. On December 27, 2009, commenting on reports that Umar Farouk Abdulmutallab, who had allegedly tried to set off a suicide bomb on Northwest Airlines Flight 253 on December 25, 2009, had subsequently confessed to being trained and equipped in Yemen, Thompson called for a halt to all current plans with regard to Yemen in light of Abdulmutullab's ties there, including plans to repatriate approximately 80 Yemeni captives in Guantanamo. Thompson is a supporter, and one of the proposers of, a bill to prevent auto insurance companies from using credit scores to set their rates, which supporters claim would lower rates for Americans in financial struggle. The bill proposed that auto insurance rates be based solely on factors related to "skills and responsibility behind the wheel", excluding factors such as debt or poor credit elsewhere. The bill has not been enacted. Thompson has also been a supporter of a measure to increase screening and background checks for pilot trainees to reduce chances of terrorist exploitation. The bill, H.R. 6159 would require all applicants to go through a waiting period while they are screened and cleared by the Department of Homeland Security. Currently only foreign-born trainees are required to go through this screening. The bill has not been enacted. In July 2014 Thompson joined Senator Ron Wyden in introducing a bill to limit the number of documents that are classified and to overhaul the security clearance system. The bill's fate is unclear. Aviation Security Stakeholder Participation Act of 2013 (H.R. 1204; 113th Congress) – Thompson introduced this bill on March 14, 2013. If it became law, the bill would direct the Transportation Security Administration to establish in the TSA an Aviation Security Advisory Committee and consult with it about matters of aviation security. Thompson is also supporting a bill to prevent sleeping in United States Congress offices. Thompson joined the House of Representatives in April 1993, after winning a special election for the 2nd Congressional seat, which became vacant when Representative Mike Espy resigned. He was elected to a full term in 1994, and has been reelected 12 times. Thompson is married to London Johnson of Mound Bayou, Mississippi, and has a daughter, BendaLonne, a granddaughter, Jeanna, and a grandson, Thomas. He is a member of Kappa Alpha Psi fraternity (Gamma Rho – Tougaloo College) and a lifetime member of the Asbury United Methodist Church in Bolton. ^ "Rep. Bennie Thompson". GovTrack. Retrieved August 14, 2012. ^ "Membership". Congressional Black Caucus. Retrieved March 7, 2018. ^ Associated Press (April 27, 2006). "11 House Members to Sue Over Budget Bill". ABC News. Retrieved February 20, 2007. ^ Associated Press (November 6, 2006). "Judge Dismisses Budget Bill Lawsuit". ABC News. Retrieved November 28, 2006. ^ "Gitmo transfer to Yemen in doubt". United Press International. December 27, 2009. Archived from the original on December 27, 2009. 'I'd, at a minimum, say that whatever we were about to do we'd at least have to scrub (those plans) again from top to bottom,' said House Homeland Security Committee Chairman Bennie Thompson, D-Miss. ^ Josh Gerstein (December 27, 2009). "Bomb plot complicates Gitmo plan". Politico. Archived from the original on December 3, 2017. ^ Pete Kasperowicz (July 17, 2012). "House Dems look to ban auto insurers from using credit scores to set rates". The Hill. ^ "H.R. 6159". govtrack.us. Retrieved 2018-06-22. ^ Pete Kasperowicz (July 20, 2012). "Dems would require pilot trainees to be checked against terror watchlist". The Hill. Retrieved August 14, 2012. ^ "Rep. Thompson Moves to Close Flight Training Loophole". Helicopter Association International. July 23, 2012. Retrieved August 14, 2012. ^ Hicks, Josh. "Does the government have a problem with 'runaway' document classification?". The Washington Post. Retrieved August 1, 2014. ^ "H.R. 1204 – Summary". United States Congress. Retrieved December 4, 2013. ^ "'I can't afford an apartment': Congressmen sleeping in offices cry poverty". New York Post. 2018-05-01. Retrieved 2018-08-23. ^ "Candidate Details". Retrieved November 26, 2014. ^ "Election Results". Retrieved December 4, 2014. ^ "2016 General Election Results". Retrieved December 9, 2017. ^ "About". Congressman Bennie Thompson. 2012-12-03. Retrieved 2018-08-23.